Entering the phase where our sadhana becomes the sustenance for our life and our life becomes our sadhana. Calling in a new kind of sacred awareness to everything we do, everything is dedicated to our intention. Let your sankalpa fill your day and all your activities… let it infuse your conversations, your thoughts, cleaning, cooking, eating, driving. Let every moment be an opportunity to bring your intention to life, and a reminder that everything is within a much grander cycle that we can direct, manage and regulate ourselves within. Waning awareness and resistance can be eaten up by our focus, the courage and the confidence to follow through with words, actions and thoughts that are filled with positivity and awareness are fueled by the positive force we are generating and the sweet moments where it works and flows are all the fruits of our efforts.. If we take ourselves out of it, we can’t be so attached to the results, the reactions of other people or even our expectations of how things should play out. Action that is undertaken because of delusion, disregarding consequences, without considering loss or injury to others or self, is called Tamasic. I would love to introduce a yogic concept to explore in the rhythms of your day, within your energy in your practice and within the cycles of your breath. This kind of finely tuned receptivity, as you begin to observe it, will be purifying and balancing in itself. It will allow you to relax into times that require stillness, move with the calling for action and movement and view those varying states you can be in, as the constant work of your mind, body and the workings of your surroundings as a constant balancing act. Guna has no direct translatable English word, however we could use rope or strand to describe them as the three threads making up the tapestry of the workings of the universe. We know the universe is composed of matter and energy. Energy vibrates all matter in flowing wave patterns. All wave patterns continually fluctuate and change in direction and intensity; thus, change is an inherent quality of Nature. This ebb/flow pattern continuously repeats itself, just like the waves and tides of the ocean, the change in the seasons and internal fluctuations within all living organisms. Rajas is the Force responsible for activity. Tamas is the Force leading to inertia. 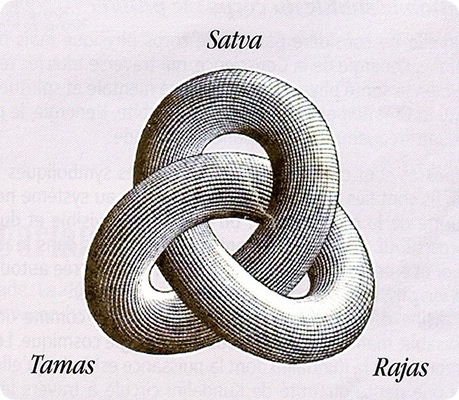 Sattva is the Force leading to observation of the other two forces - it can be referred to as the "neutral" state - the contemplative/meditative state. Sound familiar? The ebb and flow of the gunas, can be very relatable to our experience of beginning to flow with the lunar cycle. All three Gunas need to express dominance in order to maintain internal balance. When one Guna dominates too long, imbalance occurs and dis-integration of the whole living system begins. By determining which of the three qualities is at play in any given situation or circumstance, we have the power to determine how we will respond, and how we will condition our mind and body. Sattva is experienced as stillness, balance, harmony, and clarity. Emotional states associated with sattva include happiness, joy, peace, love, freedom, friendliness, openness, creativity, fulfilment and inspiration. Rajas is movement, activity, agitation and desire. Rajasic states include passion, alertness, determination, self-centeredness, anxiety, restlessness, anger, greed and worry. Tamas is the densest of the three qualities and experienced as inertia, obscuration, inactivity and fear. Tamasic states include laziness, doubt, sadness, hurt, shame, boredom, apathy and ignorance. Questions for journaling to work through at your own pace, set a timer or write a page per question. Dig a little deeper when you meet the first moment you feel you’ve written enough. There’ll be more. Have a read of the passage from the Bhagavad Gita above and write your sankalpa at the top of your page. If we can continuously circle our sankalpa back to being Sattvic at its essence, we can use Rajas and Tamas as turns of the wheel to keep us on the road. Write/draw what that feels like, looks like when this Sankalpa is fully integrated in your life. What could you bring into this moment that could contribute to your broader vision? What would it look like/feel like for me to move towards my sankalpa, my hearts desires in a balanced, intelligent, sensitive and harmonious way? Lets get a little more practical, with your sankalpa as the undercurrent of direction, the movement and conspiring of the universe - and look at very specific areas we can break down and develop. Examples could be specificities in the areas of money and material wealth, love, acknowledgement + praise, success, relationships, health, enjoyment. *The bija sound shreem in this moon mantra represents the quality of sustenance, abundance and life-force. The life affirming practice of being able to flow with the natural cycles within us and around us. Continue on with Sama Vritti, beginning to explore the retention of the breath at the end of the exhale. Start looking to how can the quality of the exhale bring me back to Sattva. Give me the mental and energetic balance to reveal how things honestly are and what I need to do to stay balanced. Following Sama Vritti, a short meditation to begin cultivating Sattva as the inner intelligence of the prana shakti within you, allowing you to move closer to the means to bring your innermost desires into fruition. Taking us deeper into equanimity, the state required for deep connection to spirit, creativity and the resilience within deep-seated contentment and happiness.